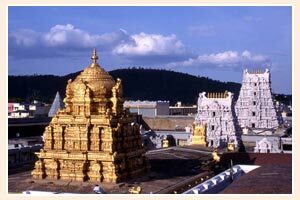 Tirupati is said to be the Temple City which is located in the state of Andhra Pradesh. The existence of the city is owed to the sacred temple of Lord Venkateshwara or Lord Vishnu which is located at the foot of Tirumala Hills. This temple is said to be the most visited religious place in the world and is visited by 60,000 pilgrims every day and up to 200,000 on special occasions. This temple has a self-manifested idol of Vishnu and attracts tourists from world over. Also, this temple is richest in terms of offerings that are made to the temple by the pilgrims. The other names for the deity are Balaji, Srinivasa, Venkateswara and Venkatachalapathy and are considered to be a boon-granting lord of the “Kali Yuga” which is the last age of Hindu cycle of ages. The temple complex has more traditional temples located in it.